So you bought an i9, the chip is basically an 8 core 8700k... look on the bright side. You get a fancy package! What can you do with it? ANYTHING!!! I put a light inside mine ;) I plan to hang the other one and put an actual LED bulb inside of it though, gonna be real cool. Thanks to the "update feature" implemented here on Steemit, I can actually edit this post in the future and show you my results. Well, here they are in all their glory! 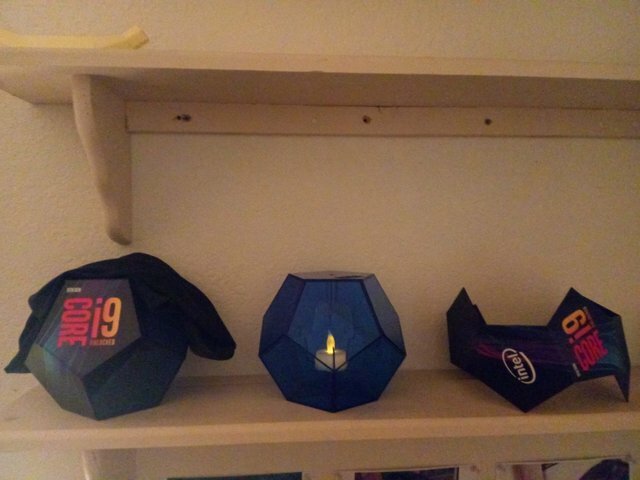 The Intel Dodecahedrons! !